In general, Hamilton beach 31333 Convection Toaster Oven is a wonderful, affordable and easy to use product that offers a comfortable cooking experience. Whether it is toasting, baking or even cooking, it brings you much convenience. What customers love most about this product are its cheap price and also its user friendly convection oven which lets you bake really fast. Now you can have convection cooking and toasting in one quite convenient appliance. It has toast, bake and broil functions plus convection function that is rarely seen on other toaster ovens at this price. 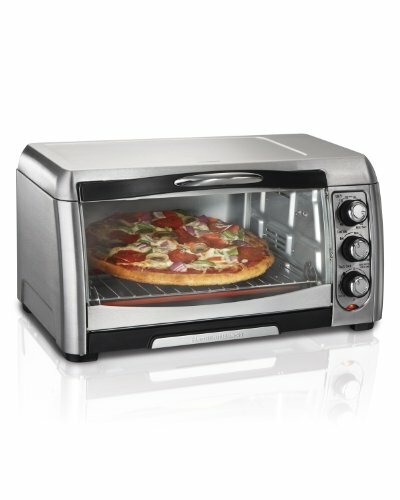 This toaster oven comes with 30 minute timer and “Stay On” Setting which makes it possible to cook as long as you wish. It can hold 6 slices of bread and pizza up to 12 inches. Its temperature ranges from 150°F to 450°F. Design – It has a shiny stainless steel exterior body which gives it a very stylish look. The unit doesn’t cost a lot of space on your counter top and is fairly small enough to fit into most places with its dimensions as 18″w x 13.5″d x 9.5″h. Also, its front door has a glass panel that lets you keep track of your food’s progress. Adjustable Rack – It comes with an adjustable interior rack which can be used to adjust the height of food and bring it even closer to the broiler. Power efficient – Hamilton beach 31333 toaster convection oven is a very efficient machine with very low power consumption as compared to normal kitchen ovens. It uses up to 71 percent less energy yet it is faster when reheating. What Do Buyers Say About The Hamilton Beach 31333? Balanced Performance – Most Buyers bought this product for its budget price with balanced performance on its basic oven functions. It gives you low power consumption, low noise, quicker baking, adjustable broiling rack and much more. Cleanup – Very easy time saving cleanup because of the removable crumb try. The toaster itself is a pretty neat device and does not create any food mess. Space Saving and Light Weight – It doesn’t take up a lot of space on your counter, while still being large enough to fit a 12 inch pizza or a 12 X 9 in. pan. It is a very light weight unit weighing very little, approximately 11.02 Lbs. Accurate Temperature – Some owners checked the temperature with an oven thermometer and found all the marked temperatures to be spot-on. Timer – The unit itself is quite soundless but the ticker timer is a little loud which some of the customers do not appreciate. Exterior Gets Hot When Working – They also think that its stainless look is great but it has its downside. The oven gets hot on the outside and you should take care touching it. Timing Digits – In my research, I found that the oven’s timing digits on the display are somewhat small which makes it a little difficult to figure out the time from a distance. This could be a problem for some elderly people. Hamilton Beach 31333 Convection Toaster Oven is one of the most perfect machines for normal daily use. It performs well with basic functions that is required and customer love what they get in such an inexpensive powerful machine with a very tasty cooking experience. Although it has certain cons yet it has a very high user rating and most of the users would recommend it to others.